Are you looking to maximize your learning opportunities at the 2019 technical conference? The Northwest Section of OWEA will be hosting a preconference workshop for those early arrival conference attendees on Monday, June 24th. Earn up to an additional 6 contact hours on top of those offered through the conference technical sessions. This years theme is Nutrient Solutions for the Lake Erie Basin and will follow the lightening round format used at OWEAs Nutrient Workshop. As our keynote presenter, we are honored to have Harry Campbell from the Chesapeake Bay Foundation come and share with us lessons learned when implementing nutrient solutions in Chesapeake Bay. We also have local experts from professors, to agriculture, to municipal representatives on the agenda. 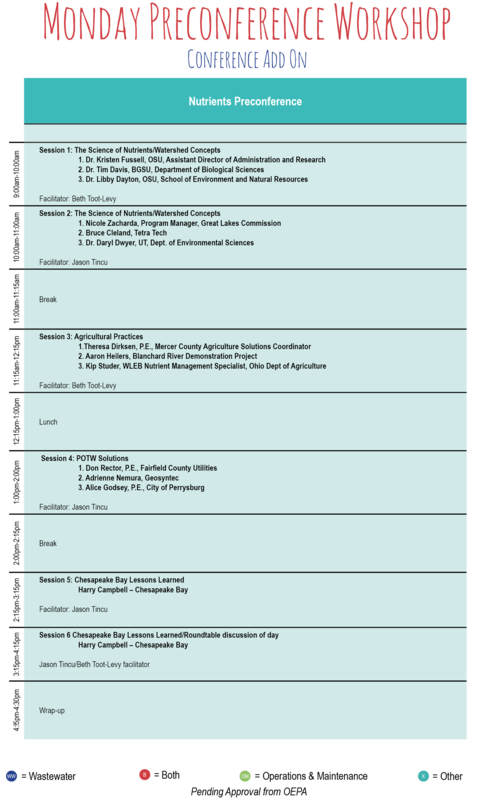 Come and learn whats being done to address nutrients in the Lake Erie basin right on the shores of Lake Erie. The cost of the preconference workshop will cover your registration for the day as well as lunch. Stick around after the workshop for the poolside conference Welcome Social open to all conference registrants, golfers, and preconference workshop attendees. Additional registered booth personnel will be given tickets to all Tuesday events including the evening Meet & Greet. Booths will be selected by the exhibitor on a first come, first served basis! If you are purchasing multiple booth spaces register early to ensure they have spots together. All invoices must be paid in full by May 17th or your booth will be released. After you complete the attendee information page you will be redirected to our interactive booth map. Select one booth and upload your logo so others will see where you are! If you are registering more than one booth, please only select one per registration. i.e. if you are getting two booths, register Bob Smith, select one booth, hit Add another attendee on the summary page, then register John Smith and select one booth for him. Continue until you have all of your booths selected. This is pivotal to make sure your booths are reserved correctly and all of your booth personnel will have the proper badges/tickets at the conference. You do not need to pay at the time of your registration but we do require payment in full by May 17th or your booth will be released. You will receive a confirmation email with your booth number. 1. No part of your exhibit may extend out of your 8' x 8' space. 2. No loud music may come from your exhibit that distracts from others booths. 3. Your exhibit must remain up during exhibit hall hours. 4. No part of your exhibit can be used to distract from others exhibits. 5. All exhibit personnel must be registered and wear their name badge. 6. Exhibitor services information will be available closer to the conference. 7. Any additional furnishings or services outside of those mentioned above must be directly contracted with the show decorator. Any additional charges are the sole responsibility of the exhibiting company including drayage. 8. No access will be available to the exhibit hall prior to Monday, June 24th. Exact access hours will be published prior to the conference. 9. OWEA is not responsible for any property loss associated with your exhibit. 10. No outside food or drink may be distributed from your booth. All food and drink for attendees must be contracted through Sawmill Creek Resort. 11. Exhibit personnel may not enter another exhibitors booth space without obtaining permission. At no time, may anyone enter an unstaffed booth of another exhibitor. 12. Cancellations must be received by May 17th, 2019 in order to be eligible for a refund minus applicable credit card fees. Any cancellations or no shows will not be eligible for a refund. On the shores of Lake Erie, Sawmill Creek Resort is a full-service hotel with a casual lodge theme. It features an 18-hole Tom Fazio design championship golf course, indoor and outdoor pools, tennis courts, a nature preserve, and lakefront marina. There is an assortment of eatery options on site in addition to the Sawmill Creek shops filled with unique clothing and gifts. The hotel offers complimentary Wi-Fi and parking on site. The OWEA rate for a standard room is $129 per night. OWEA room rates available Sunday, June 23 through Thursday, June 27, 2019. Make your room reservation by calling 1-800-729-6455. Please ask for the OWEA Conference rate. Cut off date for the special rate is May 23, 2019. Because there are limited rooms on site, Sawmill will be accepting room reservations for multi-night stays (3 & 4 nights) first and then open the reservations for shorter duration stays. Enjoy a round of golf at the Sawmill Creek Golf Club. The 6700 yard, Par 71 course was designed by Fazio and is bordered by nature on three sides with Sheldon Marsh on the West, Lake Erie on the North and Sawmill Creek on the East. The course is located right on the grounds of Sawmill Creek Resort so there is no need to travel to and from the course. A shotgun start will occur at 10:30 AM. Cost is $90 per golfer and includes breakfast, lunch and prizes/awards. Its sure to be a great time you dont want to miss. OWEA could not put on a conference without their volunteers! I can't remember my member number. Who do I call? Please contact OWEA at 614-488-5800 between 9 AM - 5 PM Monday - Friday or email info@ohiowea.org. I can't remember my username or password. Who do I call? You can use the "Forgot Your Password?" feature under the login bar. If you get an error, please contact OWEA at 614-488-5800 between 9 AM - 5 PM Monday - Friday or email info@ohiowea.org. 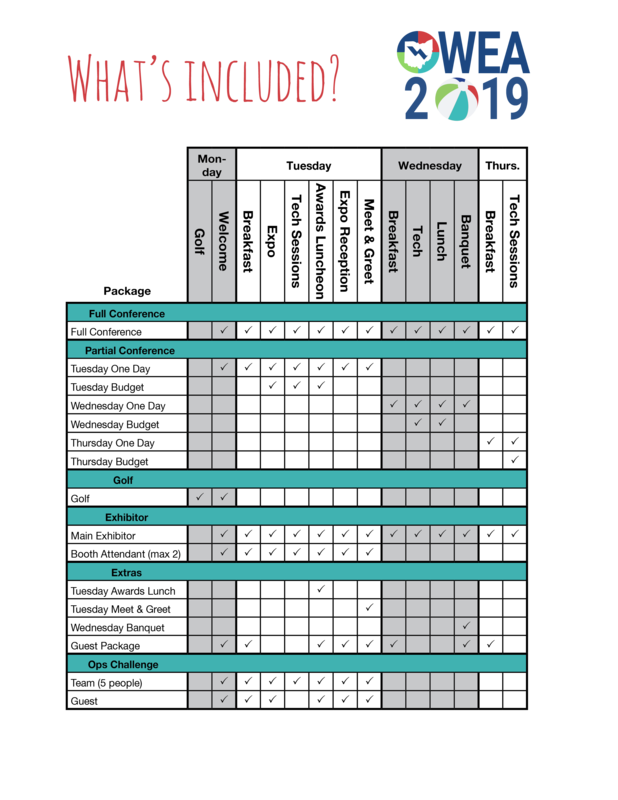 Where and when is the 2019 Technical Conference? Online registration will be available until June 17th, 2019. After June 17th all registrations will need to be made onsite and will incur an additional $10 fee. For more information and to register please click HERE. Is this the One Water Conference? The One Water Conference is a partnership between OWEA and OAWWA that has occurred every four years. 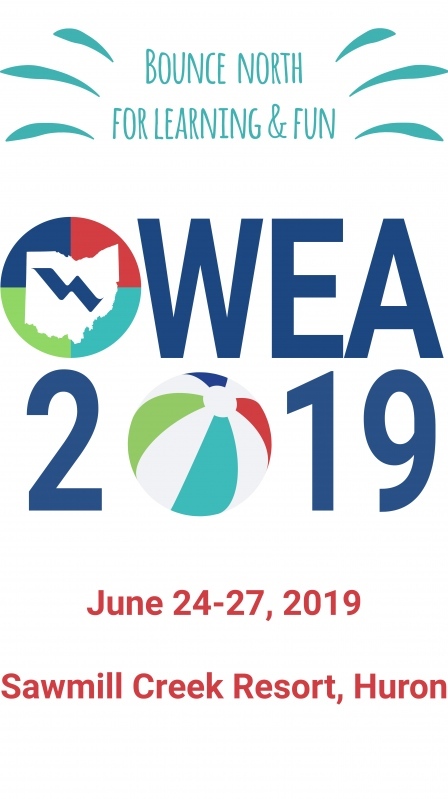 While One Water isnt available this year, please consider participating in the OWEA Conference on June 24-27th at Sawmill Creek Lodge in Huron, Ohio. My spouse/family/children/friend are coming with me to the Conference. Do I need to register them? We require a ticket for everyone--regardless of age--for all of our events. You can either purchase the Guest Package which includes all event tickets or you can purchase a singular event ticket a la cart. If your spouse/family/children/friend will not be attending OWEA events then no further action is necessary. I need extra event tickets. How do I purchase them? We encourage you to purchase additional event tickets ahead of time through your conference registration. If you need to add tickets after you have registered, but before June 17th, 2019, you can contact the office to add them for you. Tickets can also be purchased at the registration desk during the conference but could involve significant wait times. No. Substitutions are welcomed without penalty. Written substitution must be submitted by the original registrant by June 17th, 2019 in order to be processed before the conference. Substitutions needed after June 17th must be done onsite. Partial substitutions are not allowed. Registrants must transfer their entire registration to a new person, not just a portion. What form of payment can I use to register for the conference? OWEA can accept company, personal and travelers checks payable in US dollars, to the "Ohio Water Environment Association" or "OWEA"
Cash is accepted onsite only. I need a W-9 to process payment. Where can I request one? What is included in the different registration packages? Please click here to view our "What's Included?" Chart. Cancellations received June 18, 2019 or later or no-shows will be billed in full and will not receive a refund. Cancellations received between June 8 - June 17, 2019 will receive a 65% refund minus any credit card processing fees. Cancellations received by June 7, 2019 will receive a full refund minus any credit card processing fees. Cancellations must be received by May 17th, 2019 in order to be eligible for a refund minus applicable credit card fees. Any cancellations or no shows will not be eligible for a refund. Registration will open at 7 AM Monday - Thursday. How can I make hotel reservations? Please click this link for hotel booking information. I am interested in advertising at the 2019 Technical Conference. How do I advertise? Although we do not have conference specific advertisements, many companies choose to sponsor in the May Issue of our Buckeye Bulletin for added exposure prior to the conference. More information can be found at this link. I'm interested in Sponsoring at the 2019 Technical Conference. Who do I call? Sponsorship information can be found on our website here. Our detailed advertising prospectus should answer the majority of your questions and is located here. Early bird pricing ends at midnight on May 17th, 2019. At 12:01 on May 18th, 2019 late pricing begins. There are no exceptions. How many contact hours/CEU's are being offered at the 2019 Technical Conference? Monday Preconference Workshop (additional fee) offers 6 contact hours. Tuesday offers 6 contact hours. Wednesday offers 6 contact hours. Thursday offers 3 contact hours. The total conference offers up to 21 contact hours. Where is the Meet & Greet on Tuesday night located? This year the Meet & Greet will remain onsite at Sawmill Creek out on the beach (weather permitting). No transportation is necessary. Where is the Golf Outing on Monday? Golf will take place on Sawmill Creek's own golf course. No transportation is necessary. More information can be found here. Casual to business casual is acceptable. Please keep in mind that the temperature can fluctuate from room to room, so dressing in layers is a good option. What is the dress code for the Meet & Greet? Casual attire is acceptable. Please be mindful that this event will be held on the beach (weather permitting). What is the dress code for the Annual Banquet on Wednesday night? Business casual attire is acceptable. The event is not formal. I'm interested in helping out at the conference. How can I sign up? Please fill out this form to tell us your availability. That is up to you! In general, business cards, pen, notepad, and a refillable water bottle are a great start. Why do you require a unique email address for every attendee? To ensure proper credit is given to our operators and engineers alike, we require a unique email for any communication regarding your hours after the conference. We strive to provide diverse food options at each meal and will have vegetarian options available. What counts as a Retired Member to receive the discounted rate? Individuals must be completely retired to utilize this rate. This includes no part time work or paid consulting. If you are unsure if you qualify as a Retired Member, please call the office at 614-488-5800 and we will assist. I'm interested in speaking. Are you still accepting abstracts for the 2019 Conference? Our Call for Abstracts ended in December. Any open Call for Abstracts can be found on this link. A Call for Abstracts for our 2020 Conference will be opening in the fall of 2019. Thank you for your interest!